If you’ve ever waited for an update to appear on the iOS App Store, either for an available app, an app update itself, or for the Top and Featured pages to refresh, you know that sometimes the App Store can sit stale. 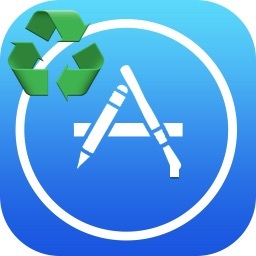 While you can often trigger an update to show up by changing the date, quitting and re-launching the App Store, or even trashing the app in question, there’s actually a way to forcibly refresh the entire App Store on an iPhone or iPad without having to do any of that. Instead, you just need to perform a curious repetitive tap trick. 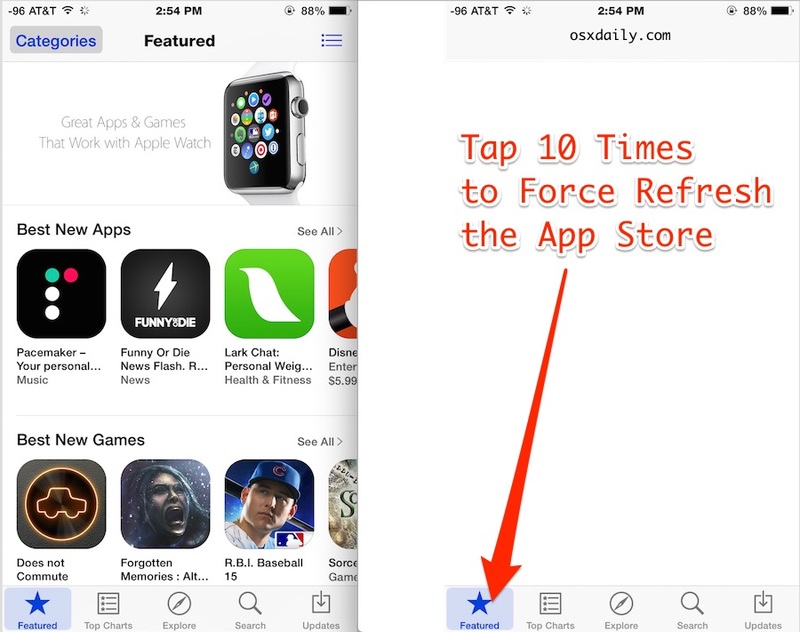 Yup, repeatedly tapping an App Store tab 10 times causes the data to refresh. It doesn’t matter which tab you repeatedly tap, just be sure to tap the same tab icon over and over again to get the refresh to trigger. All sections of the App Store will refresh regardless of the tab tapped on as well, so even if you want the Updates section to refresh so that you can find a new version of a particular iPhone app, tapping repeatedly on Features will trigger the refresh on screen. This is basically the same as hitting Command+R in the Mac App Store to refresh any of the stores accessible to OS X, and it’s kind of amazing that up until now there wasn’t really an official refresh mechanism other than some of the various workarounds on iOS to cause a refresh of App Store data. This is really not well known, and that includes myself. Up until now I’d be refreshing the iOS App Store by quitting the app and relaunching it like some kind of dinosaur, but it looks like this nifty 10-tap trick was originally discovered by iDownloadblog and it works exactly as described. Try it out, as long as you’re up to date with iOS it seems to work. Well this is nice, will have to use this when updates are available and they don’t show up on time, which seems often! Tap the “Updates” button, then pull down the screen. This has always worked for me. This was amazingly useful! Thank you!!! I haven’t been able to confirm if it helps since I don’t have any apps stuck right now, but if it helps it sounds like good method until Apple fixes the problem. There is actually a much simpler method to “force” updates. Go to the Updates page in the AppStore. Pull the page down until the rotating gear symbol appears above the Updates and let go. Still works! in 6+ years with an iPhone, I’d never heard of this… Thank you!